About Rev. Father Nigel Sequeira: Fr. Nigel Sequeira was born in Africa and studied and worked in Asia and Europe. 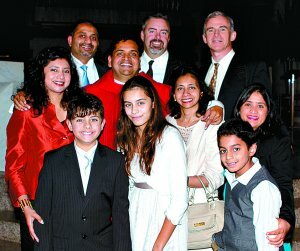 His parents Dolores (Dolly) and (late) Owen Sequeira were well-known parishioners of Holy Family Cathedral Parish, Kuwait for more than 30 years. Fr. Nigel is the second of four siblings. Even though Fr. Nigel had felt the call to the Priesthood for a long time, it was only in 2006 when he decided to make it a reality. He had his priestly formation at the Holy Spirit Seminary in Queensland and was ordained to the Diaconate in November 2010. Before joining the seminary, he worked for the Red Cross in Kuwait and as as a television news producer and cameraman for an International News Agency in the Middle East. He did a short stint in Europe, produced and filmed a documentary for EWTN and did free lance corporate video news releases. The Ordination of Deacons Nigel Sequeira and Paul Catchlove at the Cathedral of St. Stephen, Brisbane. It is with great joy that we inform our parishioners of Kuwait that (Deacon) Nigel Sequeira was ordained to the Priesthood on June 29, 2011 (feast of Sts Peter and Paul) by the Most Rev. John Bathersby, Archbishop of Brisbane at the Cathedral of St. Stephen, Brisbane. Fr. Nigel's family from overseas attended the ordination ceremony which took place in front of a large crowd of bishops, priests, deacons, parishioners and friends. Deacon Paul Catchlove, a fellow-seminarian was also ordained on the same day. Fr. Nigel said he "felt blessed" by the presence of his two sisters and their family members who had travelled from Abu Dhabi and England. "I feel really joyful and felt really peaceful during the Mass," he said. "It was just such a moving experience and lovely to have my family present and to see the joy on their faces." In his homily, H.E. 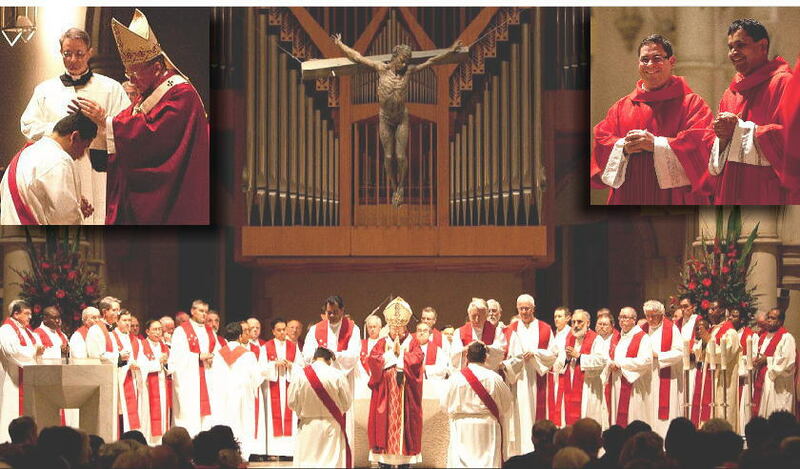 Archbishop Bathersby said, "The greatest gift priests can give is to preach the Gospel. The remarkable gift of the priesthood is if we preach it to the end ... (and) young men as priests need to understand the treasure God has given them." The Archbishop encouraged the newly-ordained priests to be "Men of the Gospel and men of prayer, men determined to change the world for the better." Fr. Nigel said he owed much to his parents for his early formation in the faith. "Being Catholic was and is a large part of our identity," he said. "My mother is a kind and loving person who would help anyone and always cared for people ... (and) she would always go to Mass. My dad would always say, 'Nigel, I just want you to say a small prayer ... (like) I love you, Lord, and I worship you'." To those who knew him well, it came as no surprise that this handsome young man had chosen to become a priest, as he was always an intensely spiritual person. He attended daily Mass and was always ready to help with parish activities. "Father Nigel will never have a problem drawing people to the Lord," said a friend of the family, "He has been ministering to people even before he became a priest. He was a very friendly person and this won him many friends especially among the youth in Kuwait. 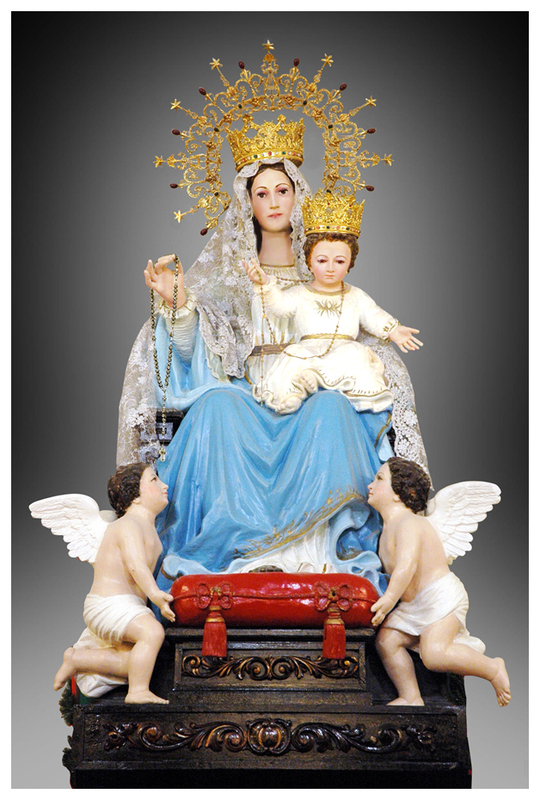 We can never forget his devotion to the Holy Rosary and how he would recite it with his family and friends!" Fr. Nigel spoke of many mentors, priests and religious who had a part to play in his vocation. He was grateful to H.E. Bishop Francis Micallef, ocd, "an inspirational priest who led by example" who was at that time the Apostolic Vicar of Kuwait. He also thanked Sr. Libanos Ayele, a Comboni Sister who was his spiritual director for many years and Fr. Lionel Braganza, sdb. He continued to say that he was looking forward to opening people to the comfort and love of God in every situation and in every part of their lives. "God has worked in my life and it has brought me such joy that I look forward to being present when other people experience this joy." When he was in Kuwait, Nigel was a friend and mentor to the youth of the parish and had been very active in the youth groups, notably that of Salmiya. He supported the WYD animators who were preparing for the World Youth Day in Sydney. He also shared his expertise in bringing up their parish youth bulletin. Presently, Fr. Nigel is in Bangalore to share his joy and celebrate the Holy Eucharist for his mother and relations who were unable to travel to Australia. We convey our hearty congratulations and wishes to Father Nigel and his family and pray that God may abundantly bless his priestly ministry.